Time for Metal Mummy's movie meme. I have spent far tooooooooo long thinking about this one...... favourite chick flick. 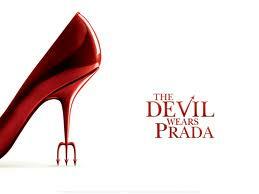 I have picked The Devil Wears Prada. I can relate. I often work in P.A. second in command roles AND I have had 2 bosses like this. So much so that the 2nd one bought me a Prada bag (yep a real one) in homage to the film. I bought it as soon as it came out on DVD. Actually another movie I did that with, was The Time Traveller's Wife, which I wrote about here. Ooooh great film! I totally forgot about this one. Not seen Time Travellers Wife but I've read the book and it's FAB! Mind you, I like most things with Meryl Streep. Ooh I hadn't remembered this one when I was thinking about Chick Flicks.....now I like this movie....and it has good memories attached to it - it was one of the movies I watched on my flight to America when I moved here. Love the clothes and love New York! Do you know what my husband preferred this film more than I did, strange bloke, I don't know all a bit too much fashion for me, did like it when she went back to proper her at the end though!